Let me guess, you’re here because you have sit bone pain. Whether you want to call them sit bones, sitting bones, or even sitz bones, (By the way, “sitz” comes from German verb “sitzen,” meaning “to sit.”) what we’re talking about are technically called the ischial tuberosities. 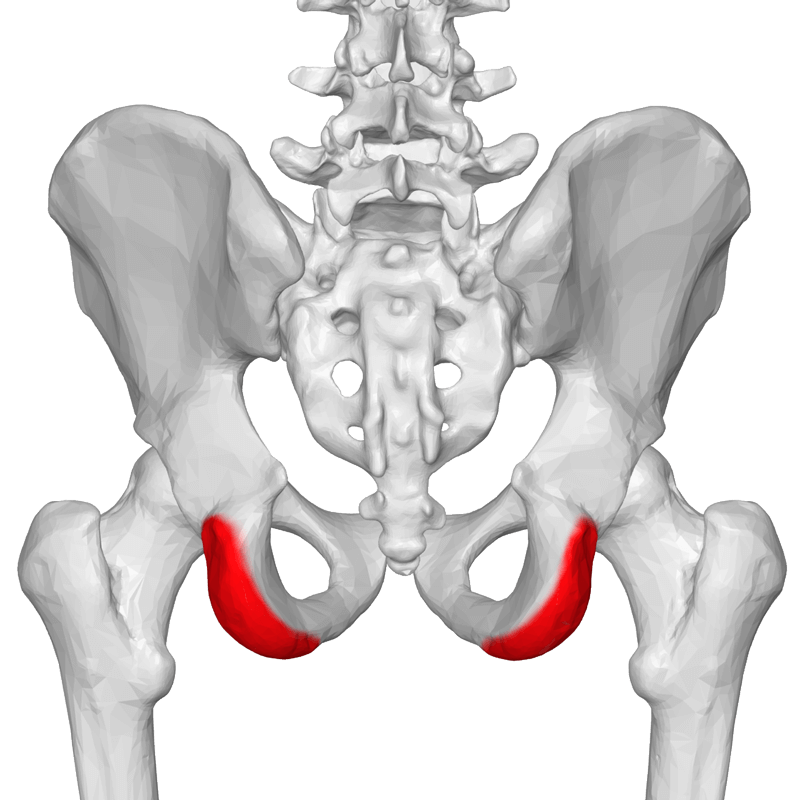 Ischial refers to the name of the area of bone on your pelvis and a tuberosity is a large bump. Your sit bone pain is real and I’m sure you want to know what to do about it. How best to manage sit bone pain depends on the cause of the pain. 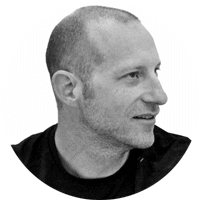 I’ve learned from working with many clients and students that what we think is the cause of sit bone pain and what the cause really is are often two different things. In fact, figuring out the cause of sit bone pain can be the trickiest part of managing it! If you can’t figure out what caused it, then you might choose the wrong way of working with your sit bone pain, all the while wondering why it never gets any better. You can always check out my original article on sit bone pain here. Overdoing forward bends in yoga and creating general inflammation at the hamstring attachment. Over stretching (tearing) a hamstring which usually happens with an audible pop. Trigger points that are referring into the sit bone area. A running related strain or injury. There are some important questions you may want to ask to help identify the source of your sit bone pain. Is the pain sharp and only when you forward bend? Does it feel like a dull ache that includes a larger area than the sit bone itself? In other words is it your sit bone and sometimes also radiating lower, perhaps the back or side of the leg? Does it come on after sitting in a particular position for a while? Does the pain come and go regardless of activity? Does the pain go away when you practice yoga or do other activities? Do you remember the moment that this began? Has it changed since that moment if you remember? What & where are the sit bones? As I mentioned, what we commonly refer to as our “sit bones or sitting bones” are more technically called the ischial tuberosities. Ischial refers to the ischium, which is the posterior (back), inferior (lower) portion of the three fused bones that make up the pelvis. Tuberosity refers to a large raised bump on a bone. The ischial tuberosities are boney bumps located on the posterior (back) side of the ischium. We call them sitting bones because if you were sitting “properly” your pelvis would have a slight anterior tilt and hopefully you would be sitting on your sit bones! When we slouch and tuck our pelvis under we are also adding weight to the sacrum and or the coccyx (tail-bone). There are a number of important muscles and other structures that attach to the ischial tuberosities. They include each of the hamstrings (semimembranosus, semitendinosus, and biceps femoris-long head), adductor magnus, and the sacrotuberous ligament. The gluteus maximus wraps over the top of the ischial tuberosity to attach from the iliotibial band (IT band) to the sacrum. Let’s take a look at each of the muscles and how they possibly relate to sit bone pain. The hamstrings are probably the muscles in this group that we’re most familiar with. These three muscles attach to the ischial tuberosity at their proximal (top) end. At their distal (lower) end, they cross the knee joint. Because of their direct connection to the sit bone, repeated engagement, rapid engagement or stretching of these muscles can lead to inflammation or irritation of the boney attachment area. My observations are that chronically tight hamstrings that lead people to struggle and strain too much, especially in forward bending, can lead to irritation. Hamstrings that are engaged while stretching may also lead to sit bone pain. 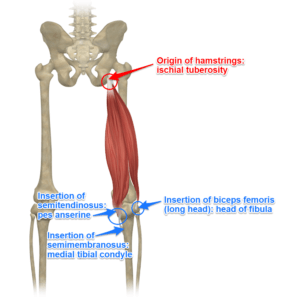 Adductor magnus is sometimes referred to as the fourth hamstring because it also attaches to the ischial tuberosity at its proximal end and a portion of its fibers extend the hip joint. 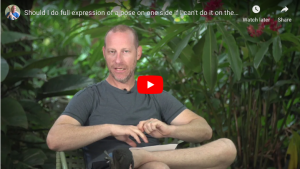 The most likely reasons for a sit bone injury at the adductor magnus are either being over-adjusted or simply going too far in a wide leg forward bend (upavishta konasana, or prasarita padottanasana). The sacrotuberous ligament is a thick ligament that connects the sacrum to the ischial tuberosity. 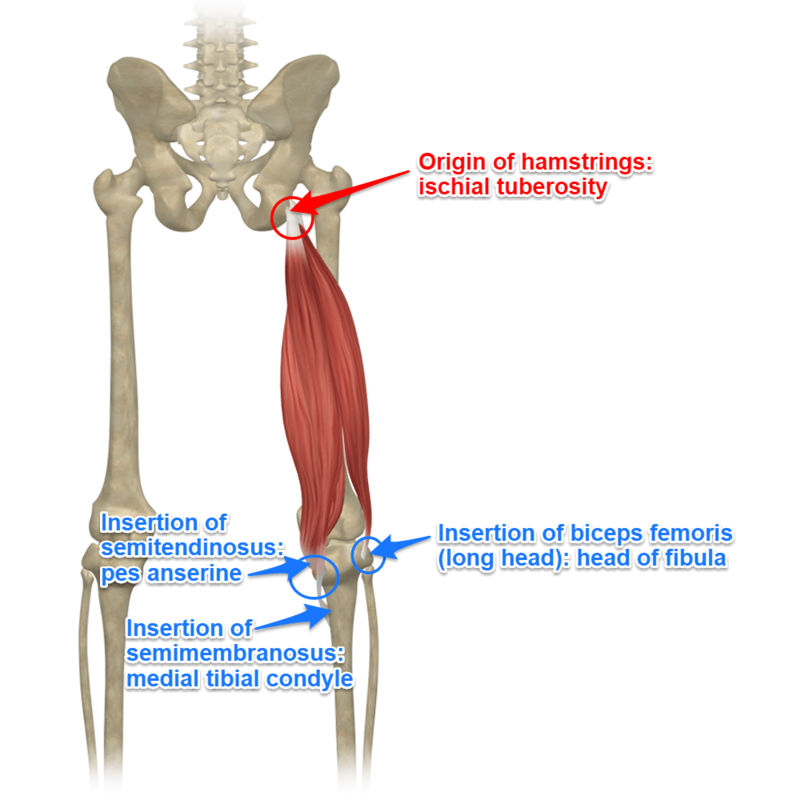 The tissue of sacrotuberous ligament is part of the same connective tissue as the paraspinal muscles that then becomes tissue that runs over the sacrum to connect to the ischial tuberosity and finally become the tendons of the hamstrings. Although it is possible to injure this ligament, usually during some kind of sports activity, injuries tend not to occur at the sit bone attachment. This ligament is far less likely than either the hamstrings or adductor magnus to be the culprit in sit bone pain. 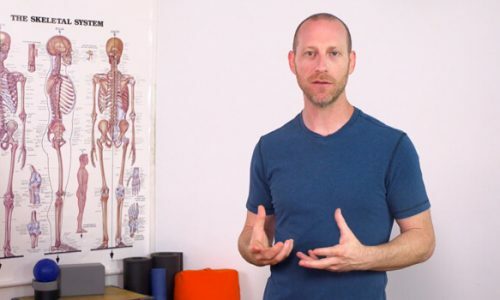 Why might you experience pain at or around the sit bones? Sit bone pain is not uncommon even for those that don’t have a yoga practice. It is also common among activities that require running, such as soccer. There are a couple of overlapping issues related to sit bone pain, so it can be coming from a number of different places. Figuring it out isn’t always so easy. However, there are a couple of scenarios that are somewhat common. Which scenario is occurring will change the way in which you work with sit bone pain. One likely culprit if you are experiencing sit bone pain is a torn, irritated, or inflamed hamstring. There was an audible “popping sound when the original injury occurred. How to modify practice for suspected hamstring tear or irritation? Try keeping the legs straight when forward bending (best when doing the seated version). Lengthen the spine and get the pelvis to tilt forward, but only fold to the point where you begin to feel sensation. This keeps consistent tension throughout the hamstrings rather than directing additional pressure into the already sore attachments. Another technique that can be used in forward bending while doing sun salutations is to bend the knees slightly as your hands go down to the floor. Then, lean about half of your body weight into your hands. By taking the weight into the hands, you take it from the feet, and the hamstrings don’t have to contract as strongly to keep you from falling forward. You can bend the knees when transitioning in or out of standing postures and then straighten the legs again once in the posture. One student reported that using a strap around her feet during seated forward bends, when her legs were straight, helped her keep even pressure throughout the hamstrings and significantly reduced her sit bone pain. This exercise is appropriate for someone experiencing generally achy hamstrings and/or mild sit bone pain. If you’re experiencing more intense sit bone pain, explore some of the other contributing factors and modifications first. This is an exercise that I usually give to students at the end of practice as it seems particularly effective when the tissues are warmed up, however, you could really do it anytime. You can read an explanation in this article or watch the video on this technique below. 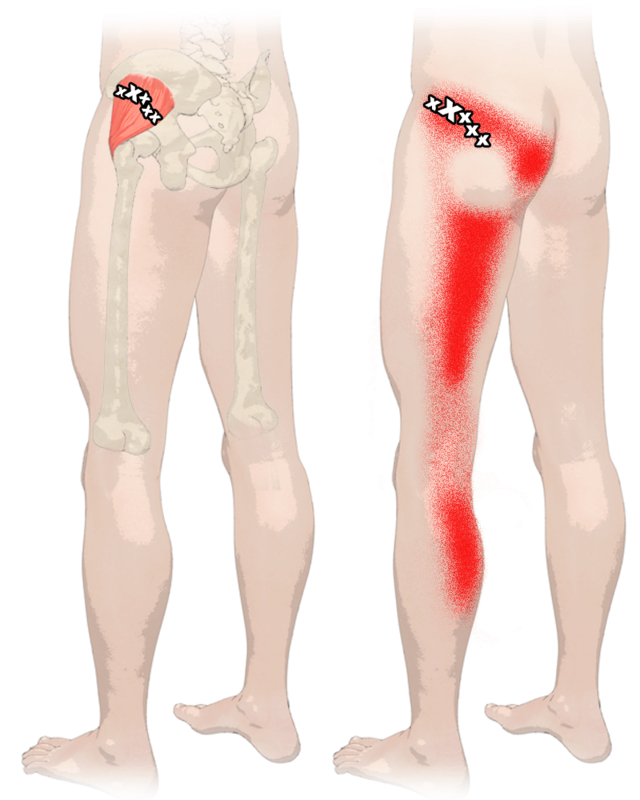 Another possibility if you’re experiencing sit bone pain is trigger points. It’s important to note that trigger points can accompany other contributors to sit bone pain. It’s possible to have torn or inflamed muscles (hamstrings or adductor magnus) and also have trigger points contributing to pain sensations. It’s also possible that tension in the piriformis muscle is contributing to this pain pattern. How to work with trigger points? You can start by doing some research at Triggerpoints.net. Search for these muscles: gluteus minimus, gluteus medius, tensor fasciae latae, and iliacus. You can check your own muscles by placing a tennis ball where you see the X’s in the diagram and leaning some pressure into that spot with your body weight. You may also want to start with a larger or softer massage therapy ball if you are feeling a lot of sensation from trigger points. Additionally, seek out a qualified massage or neuromuscular therapist. A final possibility for contributions to sit bone pain is a torn, irritated, or inflamed adductor magnus. Sit bone pain is felt in forward bending, but only when the legs are stepped wide, not when they are kept together. Students have also reported sit bone pain in other postures like trikonasana that could indicate a torn or inflamed adductor magnus is contributing to pain sensations. How to modify practice for suspected adductor magnus tear or irritation? Work wide-leg forward bends into your practice to continue stretching the adductors, but don’t fold as deeply. Keep light steady pressure on the muscles and go only as far as you can go without experiencing pain. Remember that muscles will tend to lengthen as they warm up during movement. The sensations of pain may change as you warm up during practice, so be cautious about not overdoing the stretch as the muscles may also tighten somewhat as they cool down after practice. Thanks for sharing your update. I think it’s really helpful for you to post what you discovered. I too have been working on what I thought was a hamstring issue. I took your advice and had a massage. It was not specifically trigger point but I mentioned my right hamstring problem. I was at the Omega Institute and was referred to this therapist. Ironically, when he started on my left hip, I almost jumped off the table in pain. I think it was my gluteus medius, but I’m not sure. He could not get me to a point of pain on my right side; very odd. I just did a wide angle forward fold and it felt really good but when I got up, I can now feel slight pressure in the spot. Very interesting. My point of pain has been much better. I have laid off the intense hamstring stretches for a few weeks and accomplished two 4.5 hour drives this weekend with no sit bone pain. Thank you for your continued help and keep it up! It is greatly appreciated. Would love for you to come to the Philly area for a workshop! Thanks for sharing Melissa and I hope that you continue to gain insight into the issue. This is a very helpful article. Since your original article and your response to my questions, I have been working with my Ashtanga teacher on modifying through the primary series. It is working quite well (movement without pain) though I was tentative at first. My injured adductor magnus seems to require a very bent knee in quite a few of the forward bends (almost 90 deg in Prasarita) but it is lengthening. Vandana I’m glad you’re finding a way to work with your specific problem. Keep us posted! I have an update and a question. I am still struggling with this adductor magnus therapy and am now working with a chiropracter and massage therapist to address other muscular imbalances leading to this injury. I am doing the slow static stretch at night in Prasarita to stretch out that muscle. I am combining this with daily heat/ice, glucosamine/msm and bending my knees in my ashtanga practice so i don’t feel any pain/sensation. I have a question about manipulation of scar tissue. I understand that it is good to break apart (cross-fiber friction, etc) scar tissue so it will be laid down in a more linear and lengthened way. You can do this with a ball or your fingers or by a massage therapist. Is it OK to feel pain when the scar tissue is specifically being manipulated by a therapist (with their hands, not a tool)? Is it OK to feel pain for up to 24 hours following the treatment? Is it possible to break apart the scar tissue without feeling pain? Or does pain simply mean that it will become re-inflamed and more scar tissue be laid down? With this going on so long, is it possible that you’re not on the right track? Adductor magnus and bending knees don’t necessarily go together. The original post was about straightening the knees during forward bending if you’ve been struggling with sit bone pain and believe it to be a hamstring. Are you sure it’s adductor magnus? Do you feel no pain if your feet are only hip distance apart and you forward bend? If you don’t feel anything at that moment, then I agree it’s more likely Add. Mag. Regarding scar tissue… You’re going to feel pain when its being manipulated as well as after. 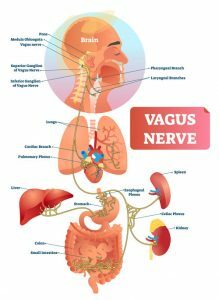 The connective tissue doesn’t live in a vacuum. Your therapist is trying to focus on it, but it doesn’t mean that it’s the only thing affected by their treatment. Your general aversion to pain is a good thing. There are however pain that is long-term good for us and short-term uncomfortable. There is also pain that feels good. I’m feeling like you might be lumping all pain into one neat and tidy category and that’s not how it is…. Keeping in mind that we’re talking about connective tissue here, right? Confirm the legs together legs apart, pain, no pain. Basically it went like this: initially, pain only in wide leg forward bends, not straight legs. Kept knees bent in standing and seated forward bends, and braced feet against the wall in seated forward bends. Visited my physiotherapist who told me to strengthen my gluteus medius(?). Pain eventually went away. THEN I probably got back to full expression of the poses too soon, and re-injured the area. Never did any scar tissue manipulation during this initial phase. It is worse now, as it also hurts in standing and seated forward bends whether legs together or apart. It was also hurting sometimes just sitting down (pressure). I tried a few different things but was not sure how to fix it on my own. Then I went to my chiropracter who did some cracking and some manipulation of the scar tissue. That felt great. I started slow stretching in Prasarita for about 2 minutes twice a day (with straight legs, mula bandha, gathered hips, microbent knees, weight in the heels, only as far as I can go with no pain). Daily Traumeel and ice. The scar tissue pain I asked about seemed over and above, as the area felt swollen and very tender and painful after. But I have since noticed that I have more mobility in the area than I have in a while. I am now keeping bent knees in standing fwd bends, but am doing straight legged seated forward bends with feet against the wall, only going as far as I can with no pain. The braced straight leg stretches feel really good and much more stable than bent knees. So I will continue with this regime (weekly chiro or massage for scar tissue, daily Prasarita stretches, ice and Traumeel). I think this will finally do it!! AND I bought your DVDs today. Found the short lotus video so helpful so looking forward to learning a lot more! These articles are so helpful. Thanks for sharing. Quick question, I have a student with tp pain at the gluteus minimus, is my understanding correct from your previous sit bone article that I should encourage straight legs while forward bending? Straight legs in the posture… yes. Transitions can bend to distribute weight. if it’s glute minimus then have them roll on a tennis ball or something similar. Larger and softer may be better at first. Ps: I borrowed another mtb bike the other week and the pain was horrendous. My bike is very comfortable. More of a forwards position as opposed to sat upright. I also know I stand with my knees bent to. Check them out as they would offer you the ability to self treat and work out some of the tension you describe. Thank you David for this article! I have suffered with sit bone pain for over 2 years now. My doctor is clueless and after 4 MRI’s still didn’t know what was causing this pain and sent me to an Ortho doc who just shot me in the bum with a very long needle. I had relief for about 2 hours and then it was back again. Your article mentioned the Adductor Magnus and your simple test confirmed that it is most likely my issue – straight leg forward bend no pain – wide leg forward bend triggered the pain immediately. Can you suggest what my next step might be? My GP doesn’t hear me when I say “pain in my sit bone” all she hears is “hip pain”. I also find the tip of my tail bone is occasionaly very sensitive…as if I fell on it and it is bruised….tender to the touch….any idea if this is related? Thank you for any guidance you can provide and thank you so much for your article! Sorry to hear about your 2 year old sit bone pain. My suggestion would be to find a really good manual therapist. Someone who deals with chronic pain and who works with trigger points and generally does problem solving. That sounds easier than it is. Start asking around where you live. It will most likely be a massage therapist but one who has done extra training in pain relief therapies. I would guess that the fall to your tail bone is related somehow, or at least overlapping. When you think you found the person… you’ll know if you’re on the right track if they do a thorough assessment and evaluation. I have had infrequent sit bone pain at night – so bad that it wakes me up and I haev to get up and walk around before it will go away. It appears to be both sides and deep into the bone. I don’t think i ahve injured my hamstring and it’s doesn’t recurr with enough frequency to tie it to any particular activity – do you have any suggestions? I can only make guesses based on what you’re telling me. Did you see the follow up article I wrote to the sit bone pain? There are a number of other reasons, pelvic floor dysfunction, trigger points or others. You may want to have an evaluation by a doctor or PT who might be able to do a better assessment than I can online. Wish I could be more helpful. This was a very enlightening series of posts for me! 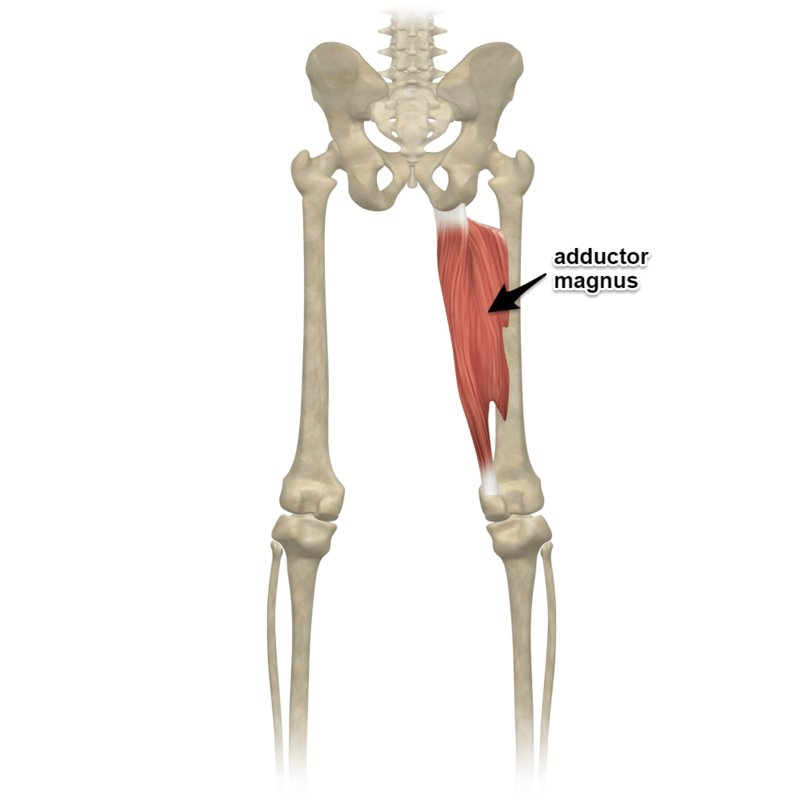 I had an injured adductor Magnus that caused me trouble for a long time …. years. I had a lot of conflicting advice from doctors and physios, none of which really helped. In fact the only thing that helped it in the long run was practicing extra prasarita paddottanasanas. To begin with I had very little flexibility in the pose, but after only a couple of weeks of doing this I already saw a great improvement and now (after about 18 months) I can do the full pose safely and without pain as part of my regular practice (taking the standard 5 breaths). And my head now gets to the floor between my feet. It’s no exaggeration to say that prasarita paddottanasana is a therapy pose for me. I’m still doing the slow version of it daily in addition to my regular ashtanga practice. I don’t have it front of me at the moment, but somewhere in In yoga mala Guruji says poses can be held for many breaths (i think he says up to 50) if you are doing them therapeutically. I was a gymnast for a very long time and after a bad injury(I was told hamstring tear) I could hardly walk and any bigger movements were out of the question. Now, eleven years later I still can’t sit for very long without pain. I’ve seen many PT’s for this and we are running out of ideas. I can do any form of stretching or exercising without pain. Just sitting triggers it. We have looked at hamstrings, adductors, sacrum, and the pelvis and are making no progress. I’m still very flexible and strong so getting me to even feel a stretch can be challenging. The doctors I’ve seen don’t believe there is an issue, because I’m in my early 20’s and apparently don’t have an excuse to be in pain. So I haven’t been able to get an MRI. But, I’m getting really frustrated and don’t know what else could be causing this problem. Any suggestions? Thank you for posting this article. It has already been tremendously uplifting. I’d bet that it’s a trigger point as shown in the diagrams above. Probably gluteus minimus. See if you can find a well trained neuromuscular therapist in your area who will be willing to treat the gluteals thoroughly and maybe you’ll find your problem. It sounds like you’ve checked everything else… why not these. Again, you’ll need someone who knows how to treat trigger points correctly and thoroughly. wasn’t until i had an x-ray of lumbar by chiro doctor who gave diagnosis of spondylolisthesis. so my opinion is it’s most likely lumbar issue like spondylolisthesis, which causes pinch/pressure on sciatic nerve, tight glute & hamstring muscles…for which the pain is always present. i’ve tried A.R.T., regular chiro care, acupuncture, massage, R.E.S.T., anti-inflammatory meds, etc., all with some degree of relief, but by no means a “cure”. i regularly do yoga, biking, pilates, & strength training. I aslo swim, ski & hike. i’ve been an athlete all my life, did competitive gymnastics in middle & high school. my degeneration is L4/L5, which ortho doc wants to fuse. i’m opting for the epidural steroid injection, plus serrapeptase supplements for inflammation. i had right side sitting bone pain for ten years and its just painful when im sitting.i have tried different things but the pain never left. I’m not sure you’ve given enough information for anyone to be able to diagnose you via the internet. I would suggest that you make sure to read all the comments in both this post and the original sit bone article as it may trigger some thoughts on your own situation. Sounds like you need to see a physio if you’re sure about your diagnosis. Otherwise, talk about what you feel and maybe I can offer an alternative. Thank you for this article. I was wondering if you can help me out a little bit. I am living in Thailand and practice yoga regularly. I find that a few hours after practicing I am getting subtle pain on my lower left buttock right in the middle. There is no pain anywhere else. I work on a computer so I am sitting a lot and it tends to worsen the longer I sit. In seated forward folds, triangle pose, or revolved side angle pose I can feel it more. I am very flexible, but lack core strength. I am limited with physical therapists or medical professional so am resulting to the internet for now. I hope you can point me in the right direction. I have had left sit bone pain for approx 6 years, I have no idea if I injured myself or not, but I remember after doing some really long bike rides, for my ability at the time they seemed long, 30 miles. I started developing this irritation when sitting down, I sad for my work 8 hours a day, and after about two years of this irritation, it became almost impossible to sit for more than 5 mins. I was lucky enough to have my work purchase a stand up desk so I could do my job. I continue to stand, and this helps, but I still have lots of pain. I have tried PT, Chiropractic, Accupunture, Steriod injections, in piriformis, and ishial tuberosity (? SP, Have had MRIs, Bone Scan, Ultrasounds, and have identified my IT busitis. However, have not found much relief, as soon as I sit down, especially on a hard surface, it comes back. The only thing that helps is sleeping. But, I eventually have to get up and go to work. Since I stand all day at work, I need to sit down at home, catch 22. As I also posted in another response… My guess is that you have an active trigger point in your gluteus minimus possibly Tensor fasciae late. That is, of course without seeing you. 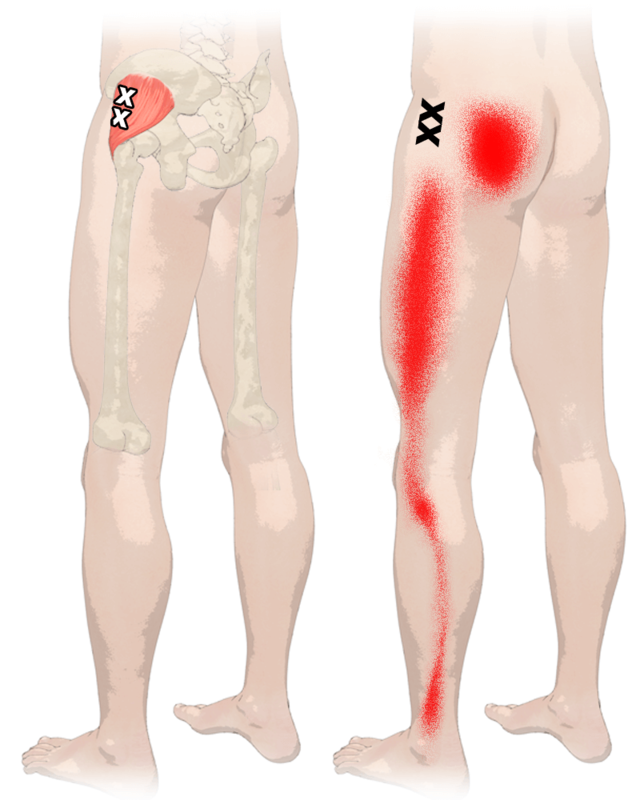 Check out the Sit Bone Pain Articles here and here and you should find some links to trigger point images. You’ll want to find a therapist who is familiar with treating them as the it’s probably not just trigger points but excess tension. You can also do some research at Triggerpoints.net Search for these muscles… gluteus minimus, gluteus medius, tensor fasciae latae, and maybe even iliacus. Thank You David for responding, I definately will take your suggestions and research the information you have provided. Please can you help me, I have been in pain since December when I had a great yoga session and the next day took a long haul flight. I have had mri and bone scans and seen a physio for 3 months, all to no avail. They found nothing wrong so diagnosed me with Periformus Syndrome. A couple of sessions of dry needling into the periformus did bring some relief, but I kept pointing out the pain feels lower down, or at least is most significant there. I’m still doing regular yoga, but getting nowhere in terms of improvement on that right side. The position in which I can most feel the pain and it completely stops me in my tracks is Standing Separate Leg Head to Knee pose, with my right leg in front, (the painful side). From all the above could it actually be the Abductor Magnus? I am going to see a pain specialist on Tuesday and before I let them inject something in me, I want to go in as informed as possible!! Thank you so so much everyone for sharing, please let me know your thoughts. Just one more thought, I also bend my knees on the seated forward bends, and that goes right into the pain, but from your first article now I’m thinking I should be straightening them? It’s very hard to figure things out via comments or emails. You didn’t describe your pain or exactly where it is, which makes things that much harder. The best I get from your description is that it is below your piriformis and obviously you’re looking for info on sit bone pain. 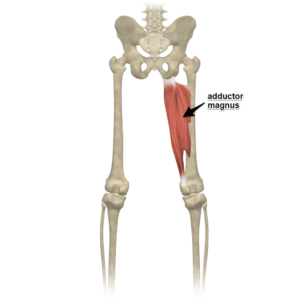 I’m sure you meant to write ADDuctor magnus. Although it could be, you would have to test for this. My guess is trigger points from gluteus minimus, anterior portion. Why? Long haul flight… this trigger point is often aggravated during prolonged sitting. Raising your leg holding it there would also activate this muscle. AGAIN, you would have to test for this in some way. Get a tennis ball. put it on the floor. Go completely sideway and lay on the floor with your right hip on the floor. Get the tennis below the top of your pelvis and behind the bump on the front. Move slowly through that area, essentially the side of your hip, but slightly more toward the front. If you find an area of pain (I’m pretty sure you will), stay there without moving for about 20 seconds and see if it brings about the pain you’re experiencing. If not, move on to a different spot. I know this is years old, but how was your ligament damage found? I’ve had X-rays and mri’s that show nothing, prp and prolo injections, trigger point work, massage….. And still I have the sit bone, glute, and upper hamstring pain. The doc that did my injections found some inflammation in sacrotuberous ligament, but no diagnostic work was ever done and I don’t even know what type of tests to consider. Thanks! David or anyone on this forum, I would truly appreciate your advice. Is it possible to have pain because of general stress without injury? Ever since I could sit I was always sitting in lotus. Grew up, studied like that, watched movies like that, if I am alone at home I’d sit in lotus automatically because it was most comfortable to me. Up until two weeks ago when all of a sudden I had a pain in my left buttock at the exact same spot as the big red spot is located in your bottom, right figure. Then a few days later it appeared in my right, as well. It hurts so much I can barely sit, but standing up from a sitting position is the worst, it’s almost as I could not walk. I didn’t do anything to strain it, all I had was that I am under extreme stress. Can that be a cause? Or my sitting thirty years in lotus backfired? It’s possible that lotus us the cause, but nothing you have written suggests that it is absolutely the case. The best thing to do is find a local professional who can ask you the right questions. Perhaps there is some other activity that you have been doing that has caused an imbalance. No way for any of us to tell via comments without seeing you move, testing a few things. Bottom right image??? I’m not sure which one you are referring to.